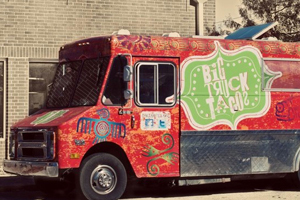 Big Truck Tacos brings Oklahoma City the most innovative Mexican street food with a twist. Selling tacos, burritos, gorditas and other Mexican and Latino cuisine made with the freshest ingredients and spiced up with some of the most unique flavors that have ever dazzled your tastebuds! Fun Fact: On the first and third Thursday of each month, from May to October, the Luchadores wrestle outside the restaurant. Get to know the Elote Luchador Wrestling Federation members. Menu Highlight: The Puffy Tacos took on the challenger in the Man v. Food Nation episode. They consist of puffy flour tortilla shells stuffed with roast beef, chicken or black beans and sweet potatoes, topped with caramelized onions, lettuce, tomato onion relish, cheese and crema fresca. 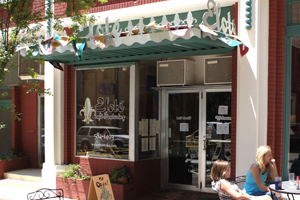 At Elote, we strive to serve you amazing food every day by using the freshest ingredients available. We know how difficult it is too eat healthy, fresh food in our busy lives. We are dedicated to making that easier for our customers. Fresh ingredients enable us to deliver tasty, healthy, filling food straight from our kitchen, right to your plate. Address: World Famous Water Hole # 2 building in historic Texola, Oklahoma. Completely renovated the original structure into the oldest building on Route 66 operating as a restaurant. 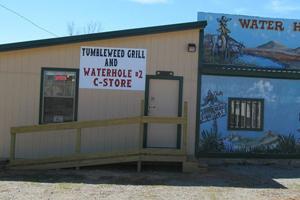 Tumbleweeds also has the only general store within ten miles of Texola. So stop by to eat and to pick up refreshments or anything else you need while traveling Route 66. After you visit us you can explore the Texola Ghost Town, which is on the Texas-Oklahoma border. It is featured in Ghost Towns of Route 66 by Jim Hinkley with photographs by Kerrick James. Don’t miss the old Territorial Jail at the end of town. Fun Fact: Outside of POPS stands a soda bottle that is 66 feet tall. Menu Highlight: On any given day POPS has more than 500 varieties of sodas from around the world available at their Soda Ranch. It’s the effervescent essence of Route 66: colorful, free-wheeling, fun. POPS answers the call of the road: our unquenchable thirst for adventure. 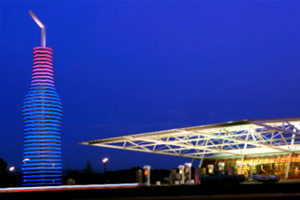 At the pumps, get an eyeful of windows artfully lined with POPS’ rainbow of sodas. Glass shelves showcase thousands of bottles, floor-to-ceiling. And make darn sure you won’t leave without coming in for a visit. Fun Fact: Clanton’s is the oldest continually-owned family restaurant in Oklahoma. 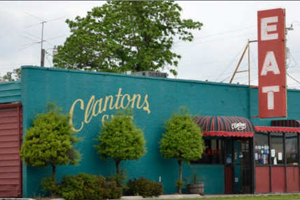 Generations of Clantons have been serving customers since 1927. Menu Highlight: Their Chicken Fried Steak was featured in Gourmet Magazine as one of the best dishes on Route 66. Generations of Clanton’s have prepared meals for their neighbors. It is the oldest continually owned family restaurant on Route 66 in the state of Oklahoma. The Clanton’s family have been deeply involved in the community of Vinita and have given countless hours and dollars to support various school, community and charitable organizations. 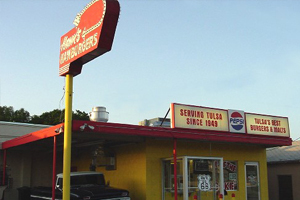 Hank’s Hamburgers has been a Tulsa landmark since 1949. Hank’s serves old-fashioned hamburgers with onions grilled directly into the meat. These delectable burgers are sprinkled with special seasonings that make the burgers melt in your mouth. Challenge yourself to the Big Okie burger, a full one-pound burger featuring four beef patties, four slices of cheese, lettuce, tomatoes, pickles and onion.